Because of friction and the rigidity of the constituent rocks, the two sides of a fault cannot always glide or flow past each other easily, and so occasionally all movement stops. The regions of higher friction along a fault plane, where it becomes locked, are called asperities. When a fault is locked stress builds up, and when it reaches a level that exceeds the strength threshold, the fault ruptures and the accumulated strain energy is released in part as seismic waves, forming an earthquake. 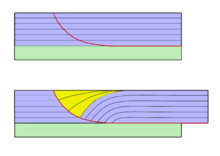 Strain occurs accumulatively or instantaneously, depending on the liquid state of the rock; the ductile lower crust and mantle accumulate deformation gradually via shearing, whereas the brittle upper crust reacts by fracture – instantaneous stress release – resulting in motion along the fault. A fault in ductile rocks can also release instantaneously when the strain rate is too great. The vector of slip can be qualitatively assessed by studying any drag folding of strata,[clarification needed] which may be visible on either side of the fault; the direction and magnitude of heave and throw can be measured only by finding common intersection points on either side of the fault (called a piercing point). In practice, it is usually only possible to find the slip direction of faults, and an approximation of the heave and throw vector. Dip-slip faults can be either normal ("extensional") or reverse. ^ USGS & Fault Lines. ^ SCEC & Education Module, p. 14. ^ "Faults: Introduction". University of California, Santa Cruz. Archived from the original on 2011-09-27. Retrieved 19 March 2010. ^ USGS & Hanging Wall. ^ Peacock D.C.P. ; Knipe R.J.; Sanderson D.J. (2000). "Glossary of normal faults". Journal of Structural Geology. 22 (3): 298. doi:10.1016/S0191-8141(00)80102-9. ^ "dip slip". Earthquake Glossary. USGS. Retrieved 13 December 2017. ^ "How are reverse faults different than thrust faults? In what way are they similar?". UCSB Science Line. University of California, Santa Barbara. 13 February 2012. Retrieved 13 December 2017. ^ a b "Structural Geology Notebook - Caldera Faults". maps.unomaha.edu. Retrieved 2018-04-06.